I love this Hotel. We’ve been several times and we are greeted like old friends, which we both love. The apartments are family run, and unlike some Hotels, the staff seem to stay reasonable constant. 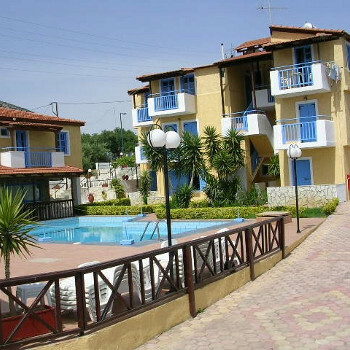 The Location is great, half way between the busy resort of Hersonissos and the older Villages of Koutouloufari and Piskopiano. If you want fast food head down the Hill there are lots of fast Food places, up the Hill lots of old style Tavernas. Again for the busy nightlife down the road and turn left and head towards the Harbour. The Apartments are situated ideally amongst Olive Groves, and are quiet when you want to sleep at night, obviously a little less quiet during the day. Of course a lot depends on the guests as it does at any Hotel. For us the Location away from the Busy Main road and the Noisy Nightlife in the harbour area is a big plus but it's only a 10 minute walk. The Hotel has a reasonably stocked bar, and also does snacks at a reasonable price, Although I must say the Chicken Fillet with a Greek salad is to die for. The beds are typically Greek! Showers and toilets are typically Greek as well. Most rooms have a balcony :- In fact I think only a couple on the ground floor don’t, these are equipped with a table and chairs where you can sit out have a drink or eat whilst taking in the wonderful views, down to the sea. Rooms have TV’s, although in several visits we’ve never ever put it on. All Rooms have a safe deposit box “ Please pay for it and use it, I’ve never known anything go missing, but if it does and you don’t have it in the box your insurance may not pay out. The Pool is clean and tidy, and there is no rush to grab a sun lounger at 7:30. Yiannis will put on a Barbecue, quizzes etc if that’s what the customers want, and he won’t push if you don’t want to take part. Yiannis can’t do too much for his Guests, he’s been known to take people from the Hotel to the Airport if they miss the bus, collect people who’ve been hurt from the Hospital, take partners over to see people in Hospital, act as an interpreter with the Local Police etc, in fact he’s far better than most of the British reps.
hi i would just like to say i had a great stay at the mariva appartments. it is ran by a very close family that would do anything for u. they are very good people also the appartments are very clean and is well looked after. i would recomend for anyone too stay there it is so close to everything and while your there make sure you ave a visit to star beach its the best beach ive eva been too its only a ten min walk from mariva appartments.